I love daffodils, my Mom has lots of different kinds and colors in her garden and every Spring our homes are filled with these beautiful Spring flowers. I am so happy there’s now a stamp and die set to re-create these beauties on paper. 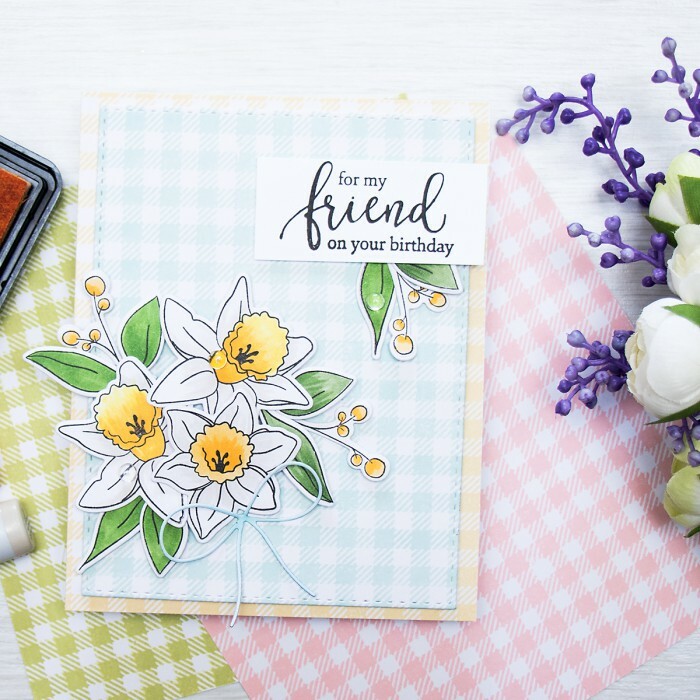 There are actually a part of the new release by Simon Says Stamp called a reason to smile – a good reason indeed! Spring is just around the corner and I personally long for some stunning blooms. 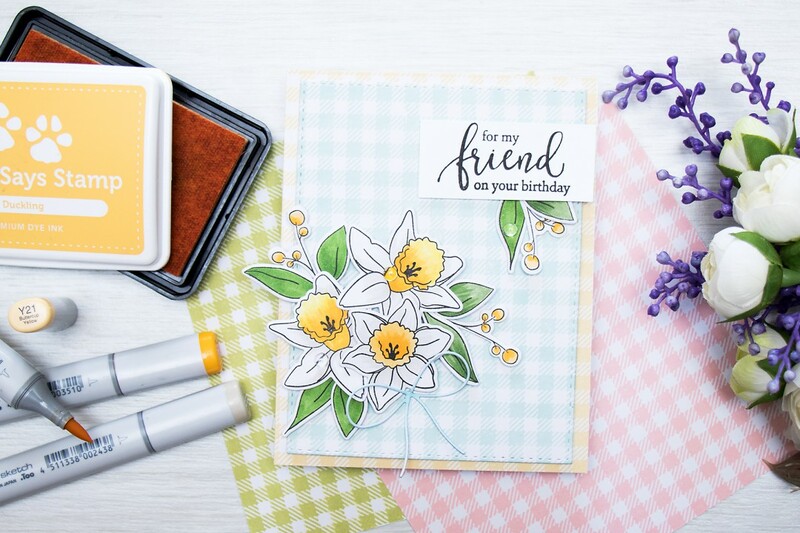 I used a few different products to create this card starting with the Daffodil Stamp set and matching dies. 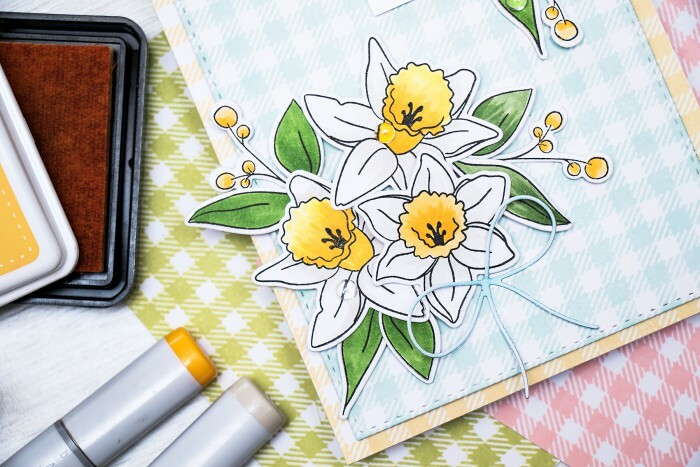 Flowers and leaves were stamped using Simon’s Intense Blank ink onto Neenah Solar White Cardstock and colored with a few colors of Copic Markers (a few yellows and green and a warm grey for the petals – check out My Favorite Copic Color Combos post to see what colors I use most often). My background was stamped using one of the new background cling stamps – I used Duckling ink to stamp the pattern onto the card base and Lake Shores to stamp it onto the panel. The panel was die cut using Simon’s Stitched Rectangle die and was foam mounted onto the card base. I also used one more die – a bow from the Chisholm Wreath to dress up the bouquet. So soft and beautiful! Love these flowers on the “tablecloth” background. 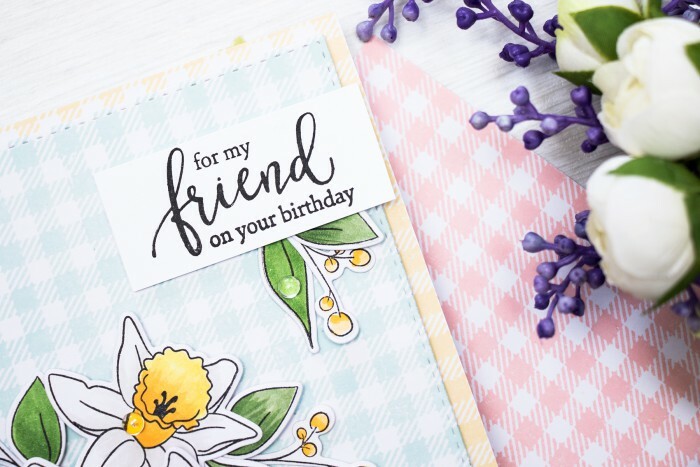 I love your stamped Gingham backgrounds. Your flowers are super pretty! 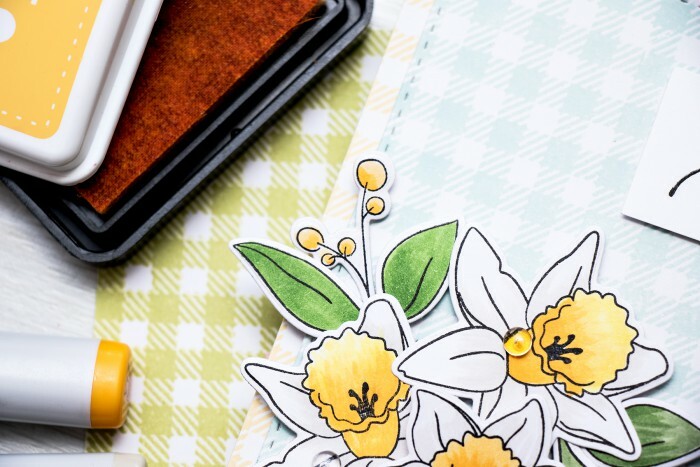 Aaah, not sure I’m going to be able to resist these daffodil stamps, they’re my favorite flower and I find this set particularly lovely! Your card is GORGEOUS! awww, thank you so much, Diane! So beautiful, and perfect with the checked background! I have lived in South Texas for almost 12 years, and have never seen a daffodil here until last year – the local supermarket has some bunches. I was beside myself with shock – the lady at the checkout asked me about them and said she’d never seen them here either. Would love to see a picture of your mum’s garden (hint hint – lol)! oh wow! I’ll need to go look for that photo, it’s been awhile! Or ask her to take one this coming Spring. Thank you! Love the background stamp! Like a spring tablecloth! I couldn’t agree more! Thank you, Kelley! Your background paper made your card! Thanks for sharing your talent! Great job on your daffodils. So pretty. Love the whole card. I love your gingham background. Fabulous daffs. Sunshine and smiles. The checked background is perfect for all things spring! I couldn’t agree more! thank you! Boy, if this card didn’t, just, take me back to parents’ house, on a Spring day!